Tattoos in the Workplace – A New Dawn Has Arrived. Once upon a time, in the bad old days, tattoos were regarded by the work establishment as part of the counter-culture that was associated with such groups as gangs, bikers, convicts and so on. People who wore tattoos were considered to be out of step with normal social conventions, outcast, rebels – free spirits who had no place in mainstream businesses and professions. But, my friends, a new revolution has changed these outdated and false impressions forever. Employers have increasingly begun to recognize that there is absolutely nothing wrong with hiring staff who wear a tattoo or two. The fact is that 14 % of ALL American adults now have tattoos and that this percentage increases to a whopping 40% of ADULTS IN THE 26-40 AGE RANGE. If we include piercings, then this number rises TO 61% OF ALL AMERICAN ADULTS. Employers from across the spectrum have realized that it would be business suicide to reject such a massive section of the available workforce, and old-fashioned notions about tattooed workers have all but disappeared. Tattoos these days have gained a much wider social acceptance, and we have seen in recent times that even senior executives in major industries are now sporting tattoos. Entry-level positions, as well as those higher up the line, are increasingly held by people with visible tattoos. Employers have learned that to draw the very best talent in the job market, it is necessary to attract staff from a wide variety of backgrounds, which includes a large number who wear tattoos as part of their social culture and life statements. This enlightened policy also applies to the retention of desirable staff. What kind of businesses and industries openly accept employees wearing tattoos? We’re not going to pretend that all businesses/professions will welcome you with open arms if you have tattoos. Clearly, the more formal professions, who still require their employees to wear business suits, will not normally welcome people with visible tattoos. But even here, tattoos that are not visible are completely okay, and it is only tattoos on areas such as the face, neck, and hands that may cause any problems. But even with businesses such lawyers, accountants, brokers/traders, management consultants, doctors and the like, we see the barriers slowly breaking down. 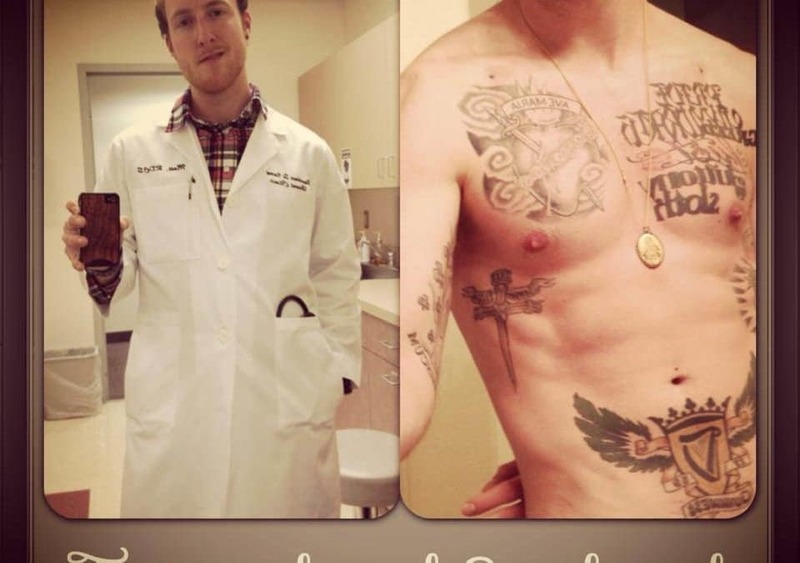 It is not at all unusual these days to meet a lawyer or a doctor with multiple tattoos – many visible – on their bodies. Most of us have seen any number of tattooed professionals daily on our televisions and on the internet. There is no question that an increasing number of industries openly welcome people with tattoos. Successful entrepreneurs such as Richard Branson and Larry Page have actively sought people who ‘think outside the box’ and who are a ‘disruptive influence’, in a positive way and this most certainly includes people who wear tattoos. Here is a non-exhaustive list of industries that positively welcome ‘inked’ staff. Creative industries, such as media, advertising, fine arts etc. Internet and smartphone app activities – media design, web development etc. Music, TV and film industries. Many service and entertainment industries, such as theme parks, zoos, etc. Bar staff and nightlife workers. Hospital staff – receptionists, lab technicians, concierges etc. Then there are ‘blue-collar’ jobs, such as factory or assembly line workers, mechanical maintenance engineers, construction workers, warehousing staff, firefighters and so on. For 99% of blue-collar positions, employers wouldn’t blink an eyelid if any of their staff wear visible tattoos. Are there any specific tattoos that may help me to get hired? Yes, believe it or not, some employers may warm to prospective employees who wear visible tattoos. Here, we are talking of tattoo designs that are ‘job-appropriate’. A fashion logo may work if applying for a job in the fashion industry. A cab or car design for a taxi driver or company driver. The list is endless – only limited by the extent of your creative imagination. Our artists at ALL DAY Tattoo in Bangkok will be delighted to discuss any original or creative ideas you may be thinking about. Yes, even in these enlightened times there are limits. For some professions, tattoos on the hands, face, and neck are a no-no, and for almost any employer, tattoos that might be considered offensive – vulgar, racy obscene – to any segment of the population will be frowned upon. Obviously, you should avoid any inappropriate tattooed message that may criticize the company who employs you or its customers. Uncovered tattoos that represent a strongly held religious belief are generally protected by law. Also, if you are discriminated against because of the language of your tattoo – e.g. say, in Spanish if you are in America, or if you are a man in a business where tattoos on women are permitted, or you are a woman, in a business where male tattoos are permitted, then you will have a very strong case for unfair discrimination against your employer. But hey! Why make waves in a job market where there are so many cool, permissive and forward thinking employers? Old-fashioned concepts, such as ‘people who wear tattoos are unprofessional’ are fast dying out. As are the notions that tattooed staff will ‘scare away customers’. A recent Fox survey indicated that 97% of adult customers would not change their shopping habits if sales staff wore tattoos. Similarly, outdated views that tattoos are a health hazard or that they are a distraction simply do not stand up to scrutiny in an age where a full 61% of American adults either have a tattoo or a piercing or, most likely, both. Now that you know you will be able to work in so many job sectors, regardless of any tattoos that you decide to put on your body, why not come and discuss your tattoo ideas with us at ALL DAY Tattoo in Bangkok? If you click the button below, you can arrange an obligation-free consultation with one of our artists at ALL DAY Tattoo in Bangkok and discuss what will work for you.